BENZ Jack is another name of WEBER Jack. Its advanced technology with high quality of production leads us to be one of the highest ranking Jack manufacturer. Most big automotive factories such as Mercedes Benz, DaimlerChrysler, Man, Renault V.I,, Scania, Paccar, Ford Otosan, Iveco, a.o. have been using our Jacks for their production nd maintenance since 1939. 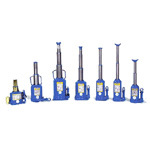 Nowadays, our low profile bottle Jacks are tailor-made for those low platform vehicles. We are going with our customers to the same path of new century.